During the sermons, His Eminence described the recent developments in the world of Islam as unprecedented and added: "By Allah's favor, these developments, which will determine the future path of the world of Islam, will continue at this rate." Ayatollah Khamenei the Supreme Leader of the Islamic Revolution led this year's Eid ul-Fitr prayers in Tehran. During the sermons, His Eminence described the recent developments in the world of Islam as unprecedented and added: "By Allah's favor, these developments, which will determine the future path of the world of Islam, will continue at this rate." The Supreme Leader of the Islamic Revolution praised the people of Iran for their massive presence in Quds Day rallies and reiterated: "This great movement will undoubtedly play a key role in the world of Islam." Ayatollah Khamenei said that this year other Muslim nations were unified with the Iranian nation on Quds Day and added: "This year, more Muslim nations - particularly in the awakened Islamic countries - stepped into the arena of supporting Palestine and by Allah's favor, this movement will continue." His Eminence stated that Quds Day rallies pump new blood into the veins of the Islamic Ummah, further adding: "Considering the continued efforts that the enemies of Islam are making in order to consign the issue of Palestine to oblivion, Quds Day rallies have become very significant." The Supreme Leader of the Islamic Revolution stressed: "The enemies of the Islamic Ummah have entered the arena with more complex machinations and with all their power in order to make these movements fail, but Muslim nations will foil the plots of the enemies." Ayatollah Khamenei stated that it is necessary to develop a deep understanding of the events that take place and to avoid making mistakes in analysis. "Wherever America, Zionism and leaders of oppressive regimes start a movement, that movement and its orientation are undoubtedly wrong. And paying careful attention to this reality prevents mistakes in analysis." 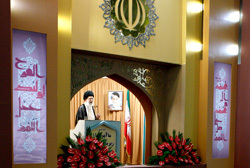 Elsewhere in his statements, His Eminence referred to the recent earthquakes in East Azerbaijan province as bitter and tragic, further adding: "The entire Iranian nation has been grieved by this tragic event." The Supreme Leader of the Islamic Revolution referred to the good measures that have been adopted in the quake-stricken areas and added: "The efforts should continue so that the heavier and greater responsibilities that we have towards our quake-stricken countrymen can be fulfilled well." Ayatollah Khamenei praised the people of Iran for helping the quake-stricken people of East Azerbaijan province and reiterated: "The people of Iran have never been indifferent in the case of such tragedies, and they should continue their solidarity and their cooperation with our government officials in order to help the quake-stricken people."